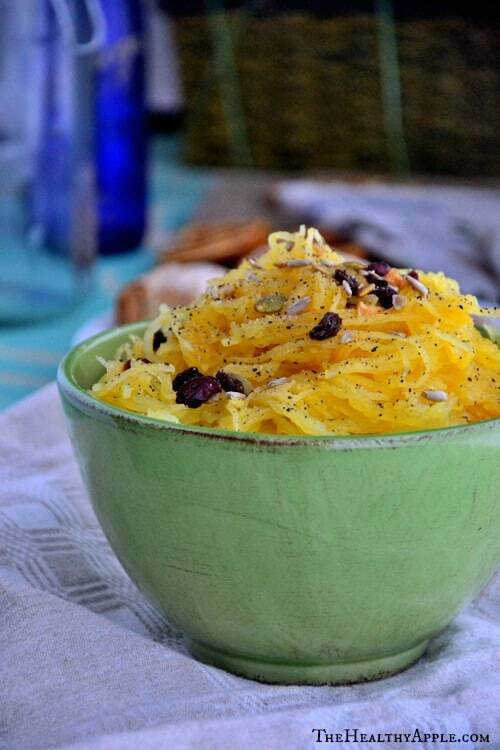 I can’t believe this is the first time I’m posting a spaghetti squash recipe. 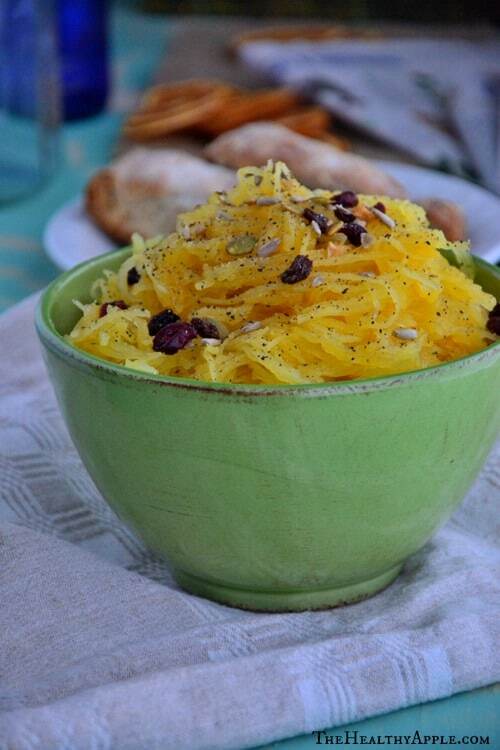 I’ve made countless recipes using this squash and it’s one of my favorite ingredients to use with my clients because it’s so versatile and tasty! 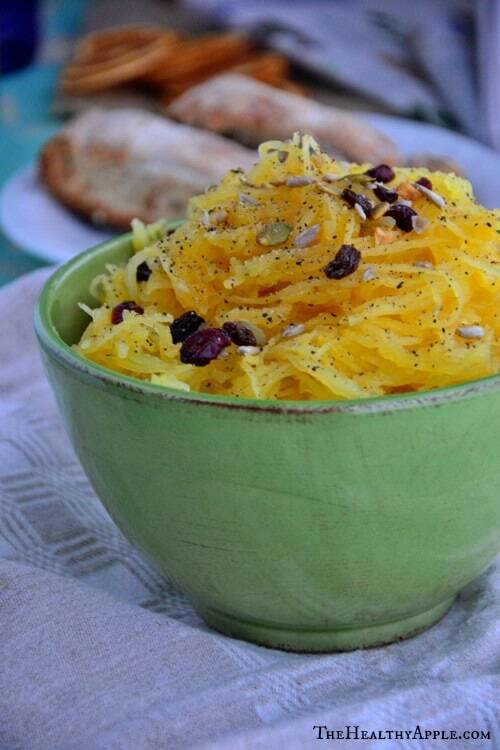 So, today….I’m sharing one of my favorite yellow squash recipes that’s tossed with dried cranberries, sunflower seeds and pumpkin seeds. You’re gunna love it. Trust me. It’s easier than you think and you can have dinner on the table in under 30 minutes with this baby. 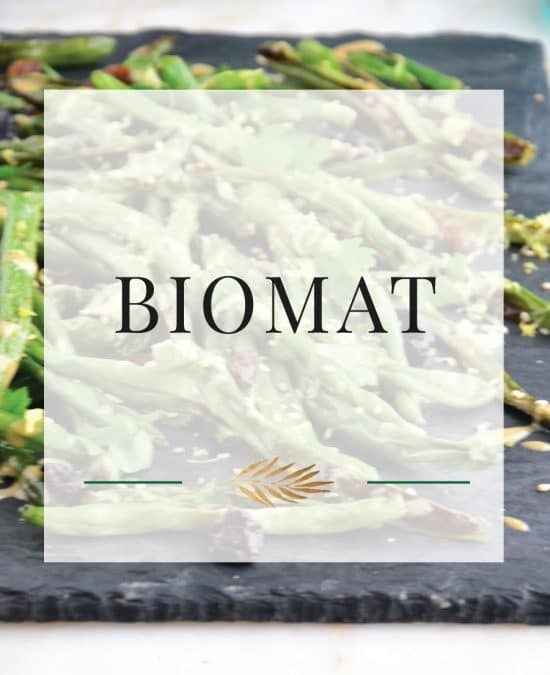 But before we move onto this recipe, I want to chat about something that I’ve been hearing a lot about lately from clients and friends and my readers- yep…that’s YOU. All of us hope, dream and yearn for love, success and happiness in our own special way but what I’ve seen is that so many of us stand in the way of creating our dreams and making them reality by listening to those awful limiting beliefs and ideas we have in our heads…whether they’re theories about life, or something we picked up from our parents… we all have these tiny little subconsious thoughts that keep us from the life and love we want. So many of you keep yourselves from living your biggest dreams because you don’t think you deserve it or you don’t fully own it. Instead of going after these dreams, you hold onto excuses and those tiny unconscious beliefs pop into your head telling you all the ways those dreams are not possible. Well let me tell you something. Do you have ANY idea how many people told me I’d never be able to do this as a full time job? Do you have ANY idea how many people laughed when I said I was quitting my corporate job to purse my website and passion? Do you know how many people still don’t believe I’m happy and successful and really, really doing IT? But ya know what? After way too many years of worrying what people think- I just did it and I’m doing it. And I don’t care. Because I’m happy and confident and loving my life each and everyday helping people like you! I know the power of believing, dreaming and creating my own dreams. 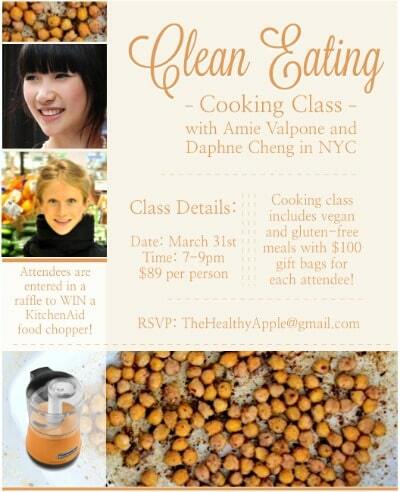 It hit me 3 years ago that I wanted to heal the world and help make a change in our food and health systems that are making so many people sick. I wanted to create more healing, more love, more compassion in the world. I didn’t know how it was going to unfold. Or how I was going to do it. But I just knew I was going to do it. In my struggle with my health the last few years, I found a way out through the science of Integrative Medicine and have been so happy to have the opportunity to share my experience, knowledge and love from so many years of pain and frustration with Western medicine. I know I have a mission – to help more people. To speak more. To write my book. To share my knowledge and help others who are chronically ill like I was and have nowhere to turn but to Western medicine drugs. I believe it. I live it and I see through all the bull- fearlessly. And now, I sit here on a chilly night writing this blog post- smiling because after months of doing the work and shifting what I was thinking and redirecting my internal compass to what I want to create- I know I will experience love and even greater happiness than I have today. I just know that I will. What I do isn’t just work, I’m on a mission. A mission to help you and to help our country- and those who are so sick- and getting no answers. Because I was there once. And it was awful- sometimes I wonder how I stayed so positive and happy through those years of Western medicine craziness. I’m honestly not sure how I did. And honestly, I think that’s the gift I’ve been handed in life. I think that was my gift and my signal to wake up, change my life with Integrative Medicine, heal my body from Western medicine and help others. And by golly- I’m doing it. 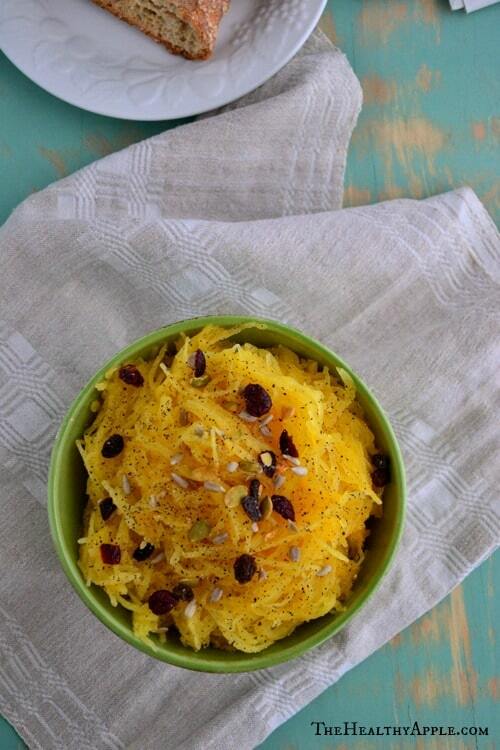 1 medium spaghetti squash approximately 2 1/2 lbs. 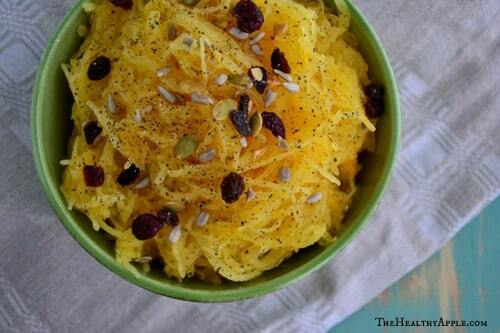 Slice the squash in half lengthwise and scoop out the seeds. Place the cut side down in a large glass baking dish. 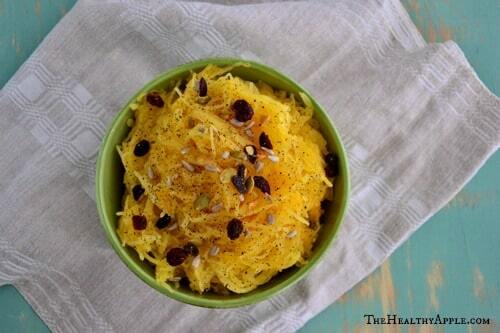 Bake in the oven for 45-50 minutes or until squash is tender. Remove from oven. 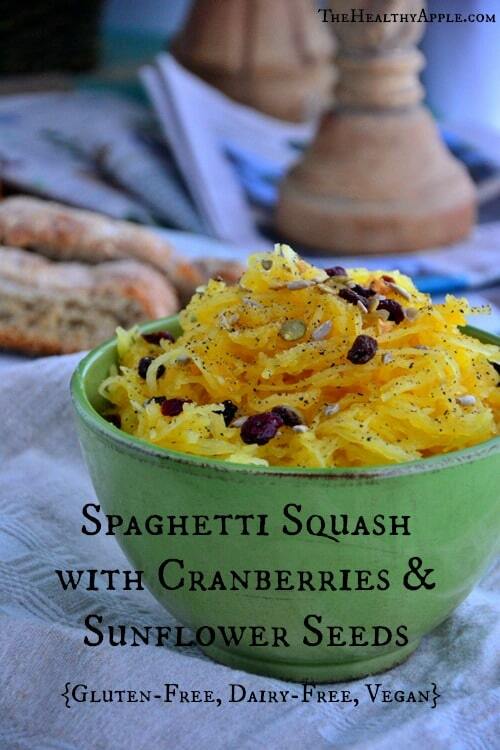 Using a fork, rake squash with a fork (looks like spaghetti) into a large bowl and toss with remaining ingredients. I read your Facebook posts, but seldom remember to check out your website. So glad to have some time to do so, today. You have a heart for nutritional health, and that is caring for others in a significant way. Looking forward to trying more of the recipes I’ve seen here. Thank you! This sounds great! My son loves pasta and sunflower seeds. Can’t wait to try this! I love going through the recipes – so many of them relate to what I am now getting in my CSA share box, and so many veggies are new to me. love this!